Sesshomaru and Yoko Kurama. . HD Wallpaper and background images in the Inuyasha club tagged: anime sesshomaru inuyasha yoko kurama. This Inuyasha fan art might contain anime, comic kitabu, manga, cartoon, and mkono. I've seen this picture on Deviant art, I have it faved on my account, the other character in the picture is actually Yoko Kurama from Yu Yu Hakusho, not Inuyasha, just so you know. I know it can be easy to mistake them if you're not familiar with the other anime YYH, which I don't know if you are or not. I just didn't want people mistaking it as Inuyasha when it isn't, out of respect for the artist. 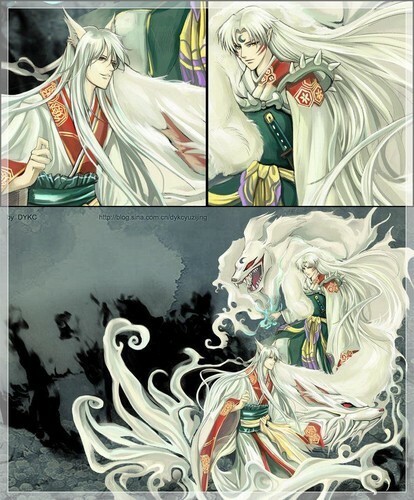 :) It does look like Sesshomaru and Inuyasha, a more mature version, but yeah.